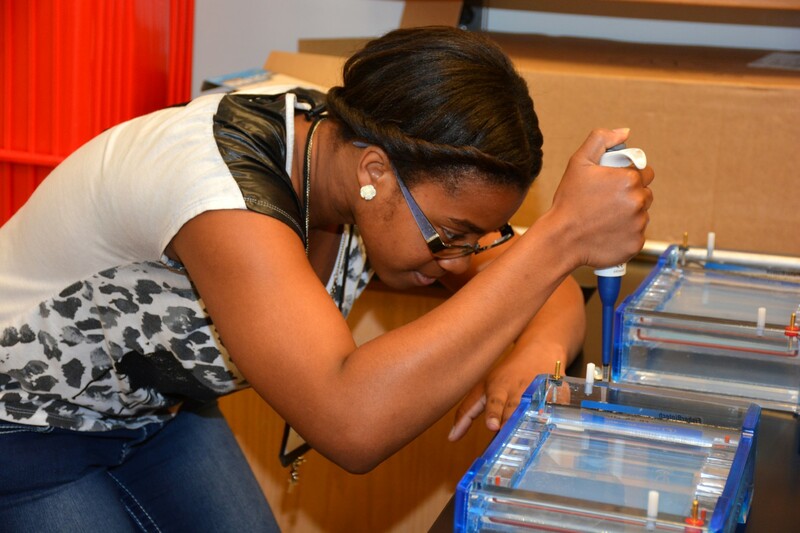 High school students from throughout the region are invited to learn about health sciences and careers in medicine by participating in the 2016 “Mini-Medical School” Summer Camp, conducted by the Wake Area Health Education Center (AHEC) in partnership with Vance-Granville Community College. The intensive, week-long day camp is being offered twice: June 13-17, at VGCC’s South Campus, located between Butner and Creedmoor, and July 11-15, at VGCC’s Franklin County Campus, just outside Louisburg. At either location, students will be on campus from 8:30 a.m. until 4 p.m., Monday through Friday. This will be VGCC’s third summer hosting a Mini-Medical School, which uses computational science (computer simulation) and hands-on activities to study key aspects of medicine. Topics include anatomy and physiology, biochemistry, pharmacology, cardiology, epidemiology, medical genetics and genomics. Becky Brady, a registered nurse and chemical engineer, will serve as the lead instructor. Participants will not only learn about training for careers in the medical field, but they will also have opportunities to become certified in CPR and Youth Mental Health First Aid (for students aged 16 and over) during the course of the camp. Campers will be able to learn more about VGCC programs that prepare students for medical careers, including Nursing, Medical Assisting, Radiography, Pharmacy Technology, Human Services Technology, Emergency Medical Services and Occupational Healthcare. Wake AHEC serves nine counties in central North Carolina from its office in Raleigh: Durham, Franklin, Granville, Johnston, Lee, Person, Vance, Wake, and Warren counties. AHECs are located throughout North Carolina and are affiliated with the North Carolina Area Health Education Centers Program at the University of North Carolina – Chapel Hill School of Medicine. The mission of the statewide AHEC Program is to meet the state’s health and health workforce needs. NC AHEC provides educational programs and services that bridge academic institutions and communities to improve the health of the people of North Carolina with a focus on underserved populations. First Aid Certifications, catered lunches and snacks. For more information and to register, visit www.wakeahec.org/hchome.htm or contact Heather Schafer at hschafer@wakeahec.org or 919-350-0468.